Momentum can shift a game in a matter of seconds. What helps that momentum shift can always be different, whether it’s a clutch shot, or a 45-yard run. 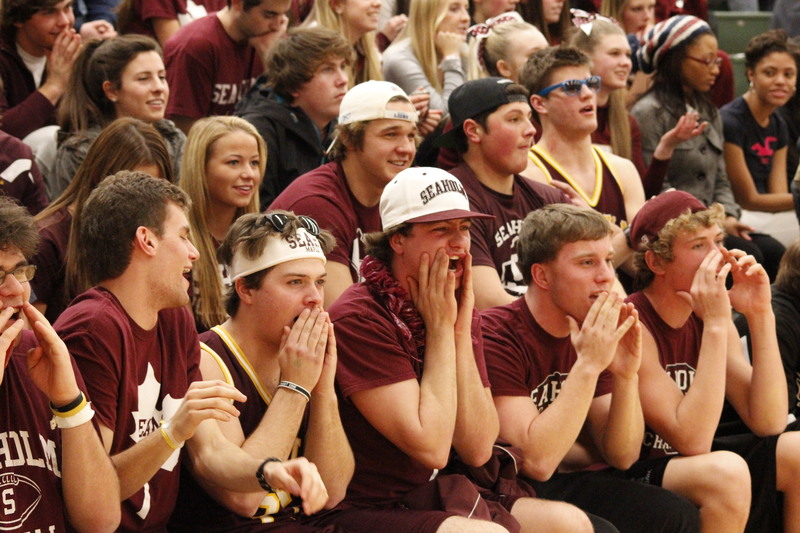 At Seaholm games, the shift often involves the roaring and screaming of the Seaholm student section, the Maple Forest. For almost every sport, the dedicated students/fans of the Maples sit in the stands, ready to cheer the team on. The students don’t hesitate to yell and scream whether it’s for a big play, a bad call, or maybe just a good call that’s bad because it’s against the Maples. But all is not well in the forest. Something is amiss in the upper decks of the stands. It is the “fans” who go for the social hangout, who sit when the forest stands, and who don’t participate in the themes or even pay attention to the game. The top half mostly consists of underclassmen. If this is how the Forest will look in two years when the involved upperclassmen are gone, Seaholm sports will become weaker and the Forest will die out. Step it up, sophomores. Our future is riding on you. The Maple Forest has always been heavily involved in football and basketball, but this past year, the Forest was very interested in the volleyball games as well. The Maple Forest was known to be effectively distracting to the opposing team and often gave a big spark to the Lady Maples to “kick the other team while they’re down” so to speak. Common jeers from the Forest included targeting the other team’s libero or screaming to the opposing server. Imagine being on the court, and hearing the jeers of the booming forest. First they try to tune it out, then they start to sweat as the screams become inescapable, and finally the forest is under their skin and they’re off their game. Each year, the Maple Forest is “handed down” to a couple juniors by the current leaders to be head of the student section the next year. Last year’s leaders included Nick Vick, Jake Badalamenti, and Andrew Weiss. This year, the leaders are Tom Scheidt, Johnny Mullen, and Thomas Constand. Next year’s leaders are still being decided. The student section has common chants and does them at most games. Some are “John-Jacob Jingleheimerschmidt”, “boom-chicka-boom”, “boom boom boom, way-ho”, and many more. These chants really help the students get involved with the rest of the section, and can often get inside the opposing team’s players’ heads. With the recent addition of the in-depth Facebook page strictly about the Maple Forest, the students are able to be completely interactive and not only find out about the location, time and theme of the next game, they can also post about something happening related to Seaholm sports. Yet, hope is not lost. Just as the current enthusiastic upperclassmen blossomed from timid, shy, awkward, overly-respectful, uninterested, pubescent, voice-cracking, and apprehensive underclassmen, so will today’s inhabitants of the upper deck. And as they move they move down to the lower bowl where the excitement happens, the forest will be renewed. As of now, the Forest is strong and lively, but it may not be in a couple years. Hopefully, the underclassmen will realize the potential of a student section and carry on the legacy of the Maple Forest.